Fortunately I haven’t had to deal with the former this weekend, but have been collating all the information that precedes the latter, namely putting together my accounts. 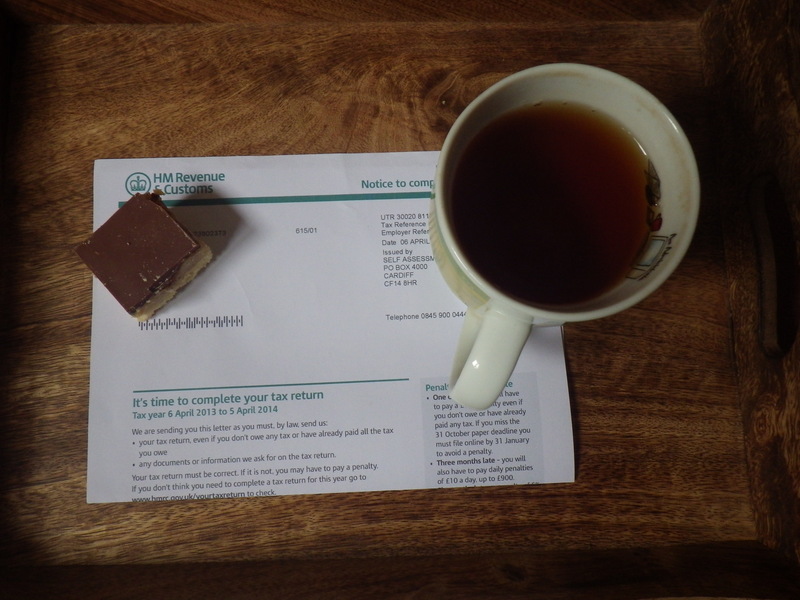 I don’t actually fill in my own tax return – there aren’t enough millionaire’s shortbreads (oh, the irony) in the world to numb the pain and and anyway, that’s what accountants are for. But I do have to dig out all the paperwork, and put it into a sensible order prior to handing it over… which is how I have spent much of today. I don’t object to paying tax – I like the idea that if my house is burning down, a bunch of professionals will turn up to put the flames out and won’t ask me for my credit card (possibly melting in the conflagration) before they do so. I like the idea of healthcare that is open to all – rich or poor. I like the fact that we care for the most vulnerable in society. What I don’t like is that if Benjamin Franklin was writing today, he’d be adding ‘except Amazon and Starbucks’ to the end of that sentence. Every country sets its own tax rates, but I think in a world of global capital, in a world where we’re competing with each other, in a world where we want to send a message that we want you to build businesses, grow businesses and invest, I think it’s wrong to have completely uncompetitive top rates of tax. High-tax countries have been more successful in achieving their social objectives than low-tax countries. They have done so with no economic penalty. So, let’s celebrate the good things that we can achieve with taxes and lets apply them fairly. After all, corporations, not being alive, can avoid death, so they shouldn’t get away with the taxes too! * I don’t always agree with what our taxes are spend on – but that’s a discussion for another post. Thank you.. I wish our government did! Did you know that if your accountant has evidence, or good reason to believe, that you deliberately put a bit of cash you received from any sort of business in your back pocket, or purse, they have to report it? This sort of tax evasion is covered by the same legislation as the laundering of money by terrorists. And there is no minimum limit. If they don’t report it, they face jail or an unlimited fine, and they’re not allowed to tip you off that they’ve reported you. Of course you’ll be in trouble too. So if your accountant has a quiet word warning you to record all your earnings, take notice, and act on it. Of course if you’re extremely rich, the rules have probably been adjusted to work in your favour, so you don’t need to worry! But I doubt if that applies to many of the Snail’s readers. Doesn’t surprise me… none of us are rich enough to be pals with Mr Cameron and his cronies… and I suspect my accountant isn’t either! I can’t speak for England, but here in the States, taxes — who pays them and what our taxes go to — are huge issues of debate. When you’re poor like I’ve been most of my life (I haven’t made enough money to pay taxes in years, and THAT’S poor) it’s of interest but most people see me as the person with their hand out so they don’t want hear my side. I didn’t receive gov. subsidies but try convincing anyone who earned more than me — esp people like my new in-laws who are upper middle class — that I’m not part of “the problem” with our tax system. I think things are similar in the UK – the media seem to want to label anyone receiving any sort of government support as a scrounger, although lots of people are simply doing their best. Of course there will always be people who take advantage of any system, but I’m certain they are the minority. I wish I believed that taxes were fair. I’ve paid them all my life and believed that because I paid in, when I was in need I would receive help. It didn’t quite work that way… Alone, unemployed and being treated for cancer, I asked for help and was told that I wasn’t eligible for anything other than the most basic financial assistance, while across the next door fence, an entire family lived on benefits, able to afford large TVs, a car each and quite amazing quantities of cigarettes and alcohol… The story has a happy ending, but if I hadn’t beaten the cancer and got myself back to work pronto, I would have become destitute, lost my home and ended up who knows where. I would be happy to pay more tax so that someone else in my situation didn’t have to worry about where the next meal was coming from. But I’m not so sure about paying for my neighbours’ booze and cigs…. I too can think of people who have not got help when they need it and those who have been able to exploit the system… there must be ways to make sure we take care of everyone who NEEDS to be taken care of. Still, if all the big corporations actually contributed, perhaps we could afford to take care of everyone better! It helped… at least I didn’t need a stiff drink to recover! I’m with you Jan. I pay my taxes, some corporation that gets a chunk of what’s left should not be able to avoid paying theirs. It’s said that if just a certain coffee chain paid UK tax then the Government would not need to be looking for ways to take Disability Living Allowances ff the disabled. Just imagine what they could do if all the avoidance was stopped. What’s worse is that the government isn’t outraged… they are far too cosy with big business in my opinion. I think Terry Pratchett had the right idea – if you serve a term in office, all your wealth is taken from you and invested in the country – so if you do a good job, and the country is in credit, once you finish your term, you make a profit – if you don’t work hard, you lose it all! Yes, if you’ve got the money, you can always find a way not to pay your fair share… and to be so removed from reality that you can’t see what real life is like. What a sad thing! How could you ever be happy if you couldn’t be “real”?